A visualisation created with GoogleEarth, showing the track of the James Cook's Endeavour voyage of 1768-1771. The pages from the Endeavour journal are also synchronised with the timeline. A close look at world maps from the 15th to 18th centuries shows that some European cartographers got one thing very wrong. A mysterious land mass at the bottom, surrounding what we now know to be Antarctica, reveals the long-held European belief in a ‘Great Southern Continent’. Finding this land, and securing a friendly relationship with its people, was one of the secret goals of James Cook’s first voyage, in 1768, on the ship HMS Endeavour. 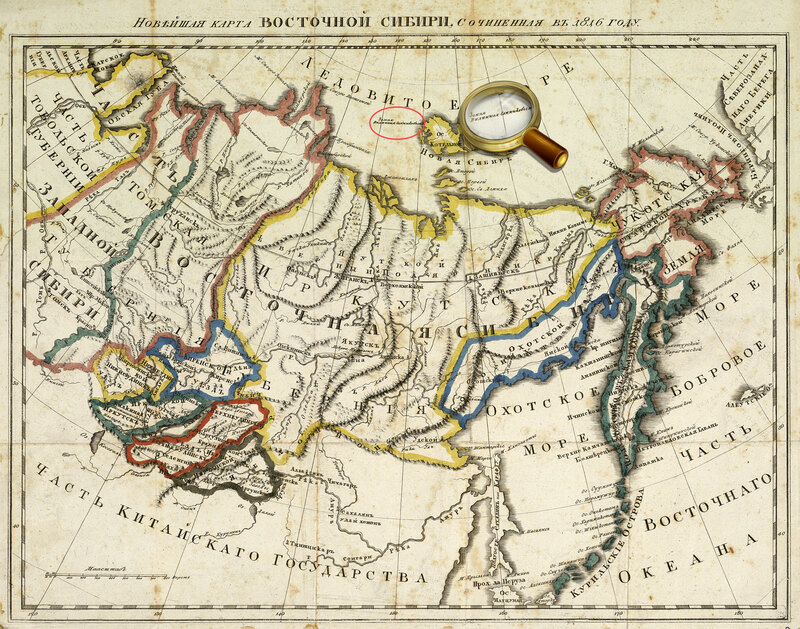 Over the course of his three voyages Cook was not only able to disprove the notion of the Great Southern Continent, but also to fill in other blank spaces on the map. A new exhibition, curated by the British Library to coincide with the 250th anniversary of Cook’s first voyage, brings together a huge array of artwork, original maps and handwritten journals from each seminal expedition. Laid out chronologically, the exhibition moves through each of the voyages, stopping off, as Cook and his crew did, at different islands and previously uncharted lands. Each new room represents a stop on the first voyage, which began in the South Pacific, landing first at Tierra del Fuego and then Tahiti. Between each such ‘voyage’ the exhibition’s path takes visitors ‘back to London’ to explore the after-effects, scientifically and politically, of each journey and to set the stage for Cook’s subsequent travels. What those of us less familiar with Cook’s voyages may not know is that as well as the requisite sailors, he was joined by artists and botanists. On the first voyage, this was largely down to Joseph Banks, a wealthy landowner and botanist who paid to join Cook on the Endeavour. As a result, the exhibition is crammed with art that attempts to bring the people and places the crew encountered to life. There are drawings of the Huash people, native to the island of Tierra del Fuego, by Scottish artist Alexander Buchan; depictions of the Maori by Sydney Parkinson, who died on the voyage back to Britain; huge Pacific panoramas and visions of Antarctic icebergs by William Hodges and engravings of tribal ceremonies by John Webber. Intriguingly, there are also drawings presumed to be the work of Tupaia, a native high priest of Tahiti who joined Cook on the Endeavour as it continued to New Zealand. Natural history also features heavily. In the New Zealand room we find a depiction of a kangaroo by Sydney Parkinson – the first European to capture the iconic animal. The accompanying plaque details the party’s discovery of an animal ‘as large as a greyhound, of a mouse colour and very swift’. There are a small number of specimens on display. Highlights include a necklace from Tierra del Fuego, a reindeer-skin quiver from the Chukotsky Peninsula, and the mouthparts of a squid, collected by Joseph Banks once he’d disposed of the body in a delicious soup. Details such as this serve to make the exhibition particularly memorable. Interspersed among the historic artefacts are videos, specially produced for the exhibition and including the nation’s favourite documentarian, Sir David Attenborough. It is here that the curators attempt to tackle the troubling side of Cook’s legacy, from imperialism in Australia and violent encounters with the Maori in New Zealand to the beginnings of a devastating fur trade. To help provide this necessary context to the subject, the British Library is commissioning a series of accompanying photography exhibits by Pacific groups consulted throughout the curation of the main gallery – the idea being to form a ‘response’ to the main exhibit by those that most felt the eventual ramifications of Cook’s voyages. This illustration shows Captain James Cook's portrait with his ships. 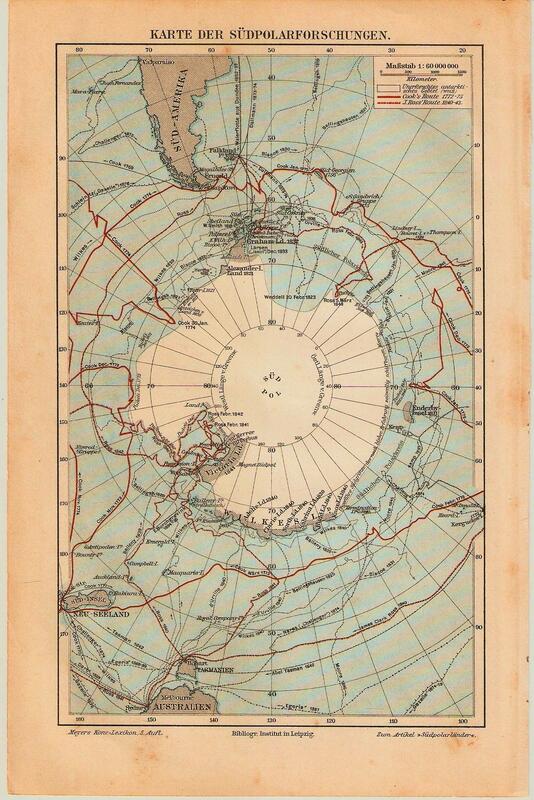 It is taken from a 19th-centry book about Arctic expeditions. and you will never pay attention to their limitations again." It’s certainly to the curators’ credit that they haven’t shied away from the more controversial aspects of Cook’s voyages. Confronting entrenched viewpoints is very much at the forefront of modern society and to have turned a blind eye to the more worrisome actions of the past would have done the subject a disservice. That said, despite a conviction at the beginning of the exhibit (in which the introductory video warns that some of what follows may be troubling), there is a sense throughout that the potential for controversy has imbued the entire exhibition with a feeling of reservation. Aside from the opulent ‘London’ rooms, there’s very little ‘decoration’ in the voyage areas, a surprising sparsity of framing information which can leave those not already possessing a good degree of knowledge of Cook and his journeys feeling somewhat lost as to the context behind many of the exhibits. Small globes adorn the start of each area purportedly showing the routes, but they’re fiddly to use and can easily be overlooked during busier times, ultimately leaving visitors sometimes feeling a touch lost as to where they currently are along the path of each voyage. Large wall maps might have served better along with a greater visualisation of background information. Strangely, the impression is almost as if by wanting to address the more controversial aspects of Cook’s legacy, a potential to offend has held the exhibition designers back. That not shouting too loudly about Cook’s endeavours is what’s needed when instead a more bold addressing of the issues would have served everyone better. Nevertheless, the exhibition skilfully interweaves this complex legacy with the wealth of materials on display and the knowledge that Cook unearthed. The take-home message is that Cook was important, but not without controversy. First voyage (1768-1771): The official mission of Cook’s first voyage was to track the planet Venus from Tahiti. Cook travelled first to Tierra del Fuego, an archipelago off the southernmost tip of South America, then on to Tahiti. He then ventured west to New Zealand where he spent six months charting the coast, proving as he went that the land was not a northern extension of the Great Southern Continent, as many had believed. 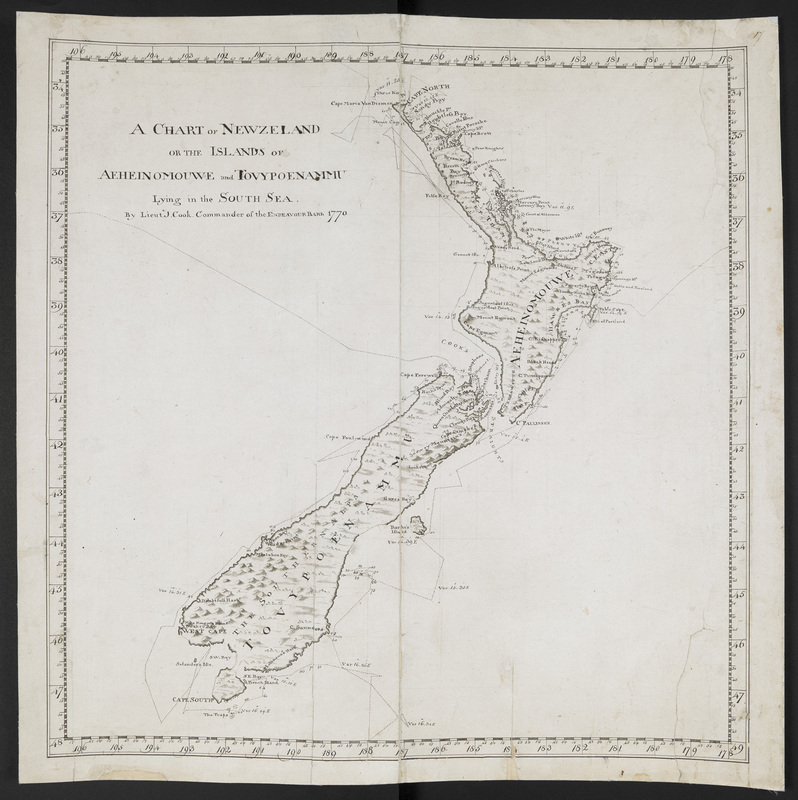 One of the jewels of the exhibition is Cook’s remarkably accurate map of New Zealand. He finished the voyage charting the unexplored eastern parts of ‘New Holland’ (the name given by the Dutch to Australia in the 17th century). Second voyage (1772-75): Cook was ordered by the Admiralty to sail south from the tip of Africa, once again on the hunt for the missing southern continent. In disproving the existence of the continent once and for all, Cook led the first expedition to ever cross the Antarctic circle. 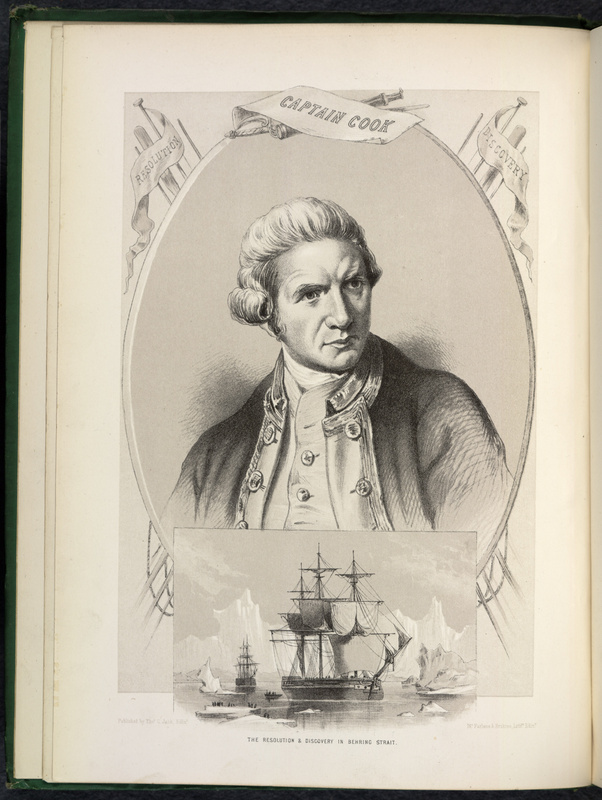 Third voyage (1776-80): The third voyage was to be Cook’s last. It was on this trip that he met his end in ambiguous circumstances on the island of Hawaii (indeed, a display of reports written by eyewitnesses to Cook’s demise makes for gruesome reading). The goal of the expedition was to explore the North Pacific and search for a sea passage to the Atlantic – a passage which, like the southern continent, did not exist. Russia's controversial floating nuclear power plant has headed out for its first sea voyage. The Akademik Lomonosov left the St. Petersburg shipyard on Saturday and will be towed through the Baltic Sea and around the northern tip of Norway to Murmansk, where its reactors are to be loaded with nuclear fuel. The project has been widely criticized by environmentalists. On Saturday a new floating nuclear power plant left St. Petersburg, Russia, towed by two boats. The two-reactor, 70MW floating power plant is headed through the Baltic Sea and north around Norway, to a Russian town called Murmansk, where the boat will receive its fuel. After a period of time in Murmansk, the power plant will be towed to a small Arctic town called Pevek, according to German broadcaster Deutsche Welle. The floating nuclear power plant, called the Akademik Lomonosov, doesn't have any of its own propulsion hardware, so being slowly towed to its destination is a necessity. The company that built the plant, state-owned Rosatom Corporation, said in a press release that the second stage of the journey, from Murmansk to Pevek, will commence in 2019, with fuel and crew aboard the boat/power plant. ST Petersburg, Russia - April 28, 2018: The Akademik Lomonosov, a barge containing two nuclear reactors, leaves St Petersburg. Once the plant reaches Pevek, it will be used to power the 100,000-person town, a desalination plant, and oil rigs. Rosatom says that the Lomonosov is intended to replace the region's Bilibino nuclear power plant, which provides 48MW of nuclear power and was built in 1974, as well as the Chaunskaya Thermal Power Plant, which is now 70 years old. Bilibino was once the northern-most nuclear power plant in the world, but after the Lomonosov is in operation, it will inherit that title. The project has not been without the kinds of delays that nuclear projects seem to inevitably face: in 2015, the Norway-based website Barents Observer wrote that the Lomonsov would be put into service by October 2016. Meanwhile, critics are concerned that a floating nuclear power plant is a situation ripe for disaster if the boat encounters extreme weather. In a statement, Greenpeace nuclear expert Jan Haverkamp cited concerns about the Lomonsov's flat-bottomed hull and its lack of self-propulsion despite the fact that it is intended to be anchored in relatively shallow water. Rosatom's press release states that "All necessary construction works to create on-shore infrastructure are underway in Pevek. The pier, hydraulic engineering structures, and other buildings, crucial for the mooring of FPU [floating power unit] and operation of a FNPP [floating nuclear power plant] will be ready to use upon Akademik Lomonosov arrival." A likely reason why Russia would want a floating power plant? The region in which it will be stationed is quite remote, and moving machinery out by land is far more expensive than moving it by sea. Deutsche Welle points out that climate change has made it easier for Russia to use northern sea routes for transportation between the country's west and east regions. Correction: This story originally said that the Lomonsov was the world's first floating nuclear power plant but in fact the US military used a floating nuclear power plant on the Sturgis in Panama between 1968 and 1975.
in place of a polyconic projection that was predominant until 1910. 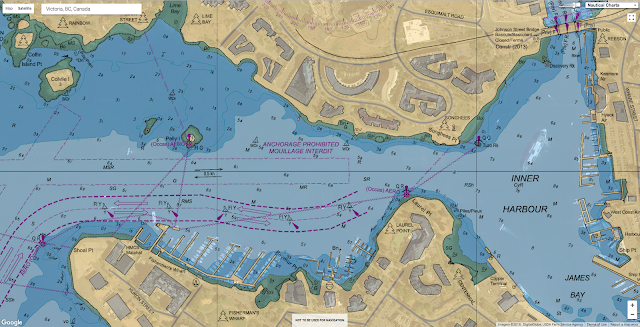 Mercator projection is now the standard for nautical charting and is used for the majority of NOAA charts. 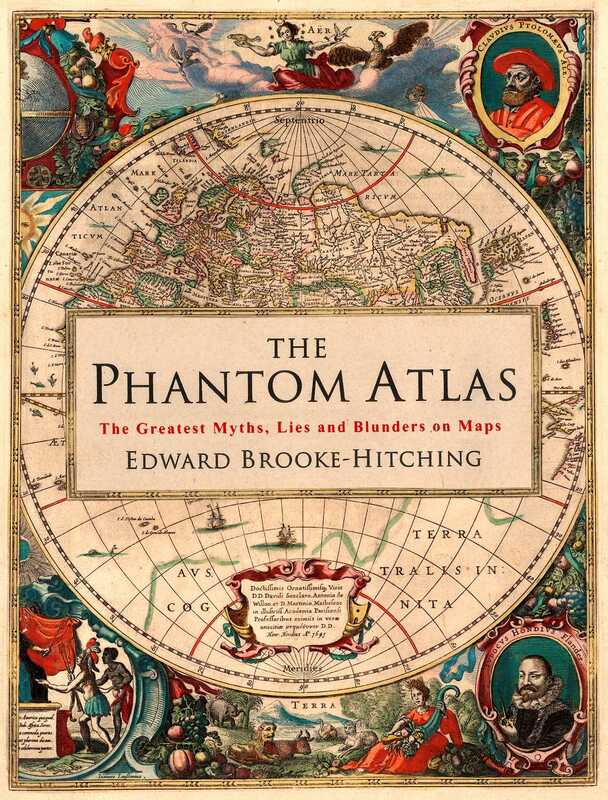 The Phantom Atlas is an atlas of the world not as it ever existed, but as it was thought to be. These marvellous and mysterious phantoms - non-existent islands, invented mountain ranges, mythical civilisations and other fictitious geography - were all at various times presented as facts on maps and atlases. This book is a collection of striking antique maps that display the most erroneous cartography, with each illustration accompanied by the story behind it. Exploration, map-making and mythology are all brought together to create a colourful tapestry of monsters, heroes and volcanoes; swindlers, mirages and murderers. Sometimes the stories are almost impossible to believe, and remarkably, some of the errors were still on display in maps published in the 21st century. Throughout much of the 19th century more than 40 different mapmakers included the Mountains of Kong, a huge range of peaks stretching across the entire continent of Africa, in their maps - but it was only in 1889 when Louis Gustave Binger revealed the whole thing to be a fake. For centuries, explorers who headed to Patagonia returned with tales of the giants they had met who lived there, some nine feet tall. Then there was Gregor MacGregor, a Scottish explorer who returned to London to sell shares in a land he had discovered in South America. He had been appointed the Cazique of Poyais, and bestowed with many honours by the local king of this unspoiled paradise. Islands that never existed inspired adventurers to undertake quixotic trips with tragic consequences. In the spirit of modern treasure hunters in quest of lost shipwrecks, early explorers scoured the seas for islands and continents born of legend, delusion and deception. Maps and navigation charts afforded their only guidance, and many are colorfully reproduced in Edward Brooke-Hitching’s “The Phantom Atlas: The Greatest Myths, Lies and Blunders on Maps.” The author details over 50 instances of fake cartography, including their reputed coordinates: from the Strait of Anian to the Phantom Lands of Zeno. 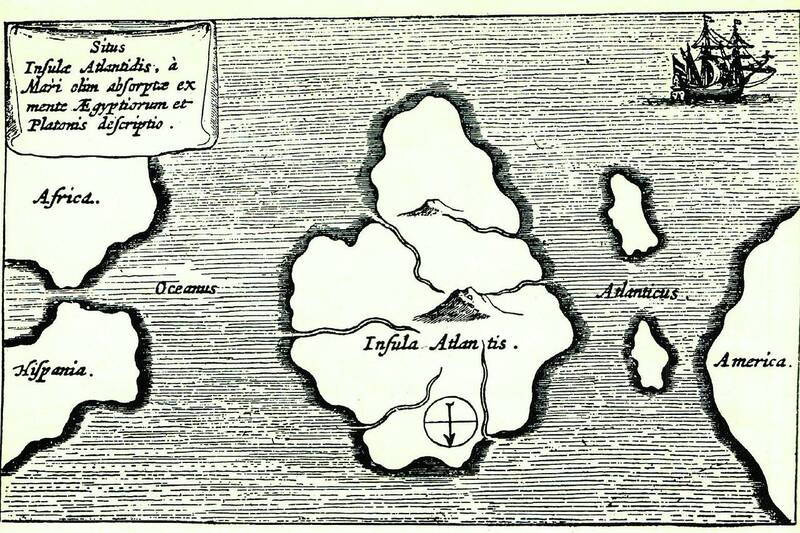 Athanasius Kircher's map of Atlantis, placing it in the middle of the Atlantic Ocean, from Mundus Subterraneus 1669, published in Amsterdam. As Mr. Brooke-Hitching describes, honest mistakes, grounded in religious dogma and classical mythology, were often to blame for inaccuracies. In the meantime the persistence of fictitious claims led innumerable generations of mariners astray. Remarkably, not until 2012, after first being “sighted” by a whaling ship in the late 1800s, was Sandy Island in the Coral Sea “undiscovered” by an Australian team of marine scientists. In time, with the proliferation of printing in the 1500s, the publication of salacious tales turned a ready profit. Besides gold, silver and precious gems, far-off lands were said to contain all manner of forbidding creatures—demons, Patagonian giants and human-shaped fruit. As Jonathan Swift mocked: “So geographers in Afric-maps / With savage-pictures fill their gaps.” Few scribes were as infamous as the 18th-century French impostor, George Psalmanazar, who claimed to be a native of the primitive island of Formosa, brought against his will to Europe by a Jesuit priest. Years after the appearance in 1704 of his adventures, a spurious publication featuring no shortage of gruesome tales, he remained a celebrity. which was allegedly seen by some researchers to the north of the New Siberian Islands. Contrary to the author’s assertion that the book’s lands and waterways “are all entirely fictitious,” he allows, in a few instances, for the possible impact of seismic shocks, volcanic eruptions and catastrophic erosion. Sannikov Island, “discovered” around 1810 in the Arctic Ocean by a Russian geographer, spurred later expeditions, all in vain, before being omitted from maps beginning in 1937. Possibly it had sunk, a common calamity for shoals saturated by permafrost in northern latitudes. Also known as Maida or the Isle of Mam, Mayda is a phantom island in the Atlantic Ocean located southwest of Ireland. Sailors in the Age of Exploration considered Mayda very unsafe — a 1397 map showed it surrounded by dragons and sea monsters, and it included a warning in Latin about the dangers waiting for anyone who sailed too close. The mysterious island first showed up on maps in the Middle Ages and continued to appear throughout the centuries, always as a crescent-shaped island. Its final appearance was on a 1906 map published by Rand McNally, a surprisingly recent appearance considering there’s nothing to be found to the southwest of Ireland. No less baffling was the fate of Mayda, an island in the North Atlantic that cartographers officially expunged after it had appeared on maps for more than five centuries. Yet in 1948, in the reputed vicinity of Mayda, where ocean depths reached 2,400 fathoms, the captain of a freighter noticed a seeming change in the sea’s color and took a sonar reading that revealed a depth of only 20 fathoms and a submerged land mass 28 miles in diameter—the victim, speculates Mr. The Phantom Atlas is a beautifully produced volume, packed with stunning maps and drawings of places and people that never existed. The remarkable stories behind them all are brilliantly told by Edward Brooke-Hitching in a book that will appeal to cartophiles everywhere. It would be wrong to dismiss “The Phantom Atlas” as an exotic side-show. Cartographic errors sowed real anxiety and confusion among mariners. They influenced shipping routes and inspired adventurers to undertake quixotic expeditions, occasionally with tragic consequences. Old map showing the Mexican phantom island Bermeja. Tanner, Henry S. - A Map of the United States of Mexico, 3rd ed. And there have been geopolitical reverberations. Just nine years ago, in the Gulf of Mexico, a controversy was finally resolved over the reputed island of Bermeja, a Mexican possession originally recorded in 1539 on a Spanish map. Locating the tiny island promised to dramatically extend Mexico’s nautical sovereignty to include precious oil rights in the Gulf. Despite a last-ditch effort, neither aircraft nor a Mexican research vessel succeeded in finding Bermeja. Diehard believers, ceding no ground, cited global warming or the possibility of an undersea earthquake—thin satisfaction at best. Because billions of barrels of oil were at stake, the CIA was also blamed for the island’s destruction. “The Phantom Atlas” will prove rewarding for armchair adventurers and nautical historians. For more intrepid souls, it affords an indispensable guide to legendary sites or, just possibly, remote realms waiting to be reclaimed. Don’t forget to bring a camera. Scientists have discovered that before the present island of Kameni inside the famous Caldera of Santorini, created after the eruption of the volcano some 3600 years ago, there was a much older Kameni at about the same point, which was completely destroyed by the volcanic eruption, an Athens-Macedonian News Agency report says. For the first time, Greek and international scientists who studied the underwater remnants at the bottom of that Minoan eruption, as well as the Andesian lava pieces in the pumice stone, proceeded to reconstitute the so-called pre-Kameni Caldera and estimated its extent, the way it was created and its age. About 22,000 years ago another big explosion had taken place in Thira — the so-called Riva explosion, from which a large semi-caldera was built. Inside it, an island was formed, the pre-Kameni, which was later destroyed, along with parts of Thira and Thirassia and it was gradually raised within it during the most recent Minoan eruption. The eruption of Santorini in 1650 B.C. was one of the largest in the last 10,000 years. About 30 cubic kilometers of magma was erupted, forming a plinian column 36 km high. The removal of such a large volume of magma caused the volcano to collapse, producing a caldera. Ash fell over a large area of the eastern Mediterranean. 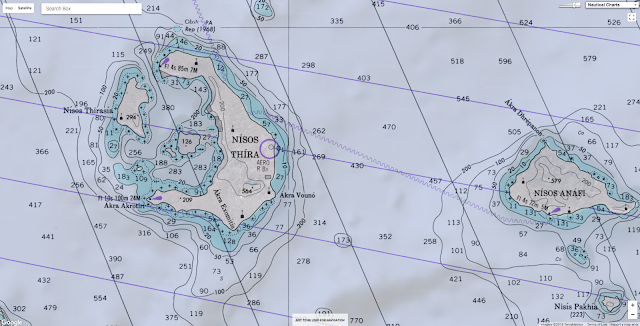 The largest island is Thera, and the smaller is Therasia. 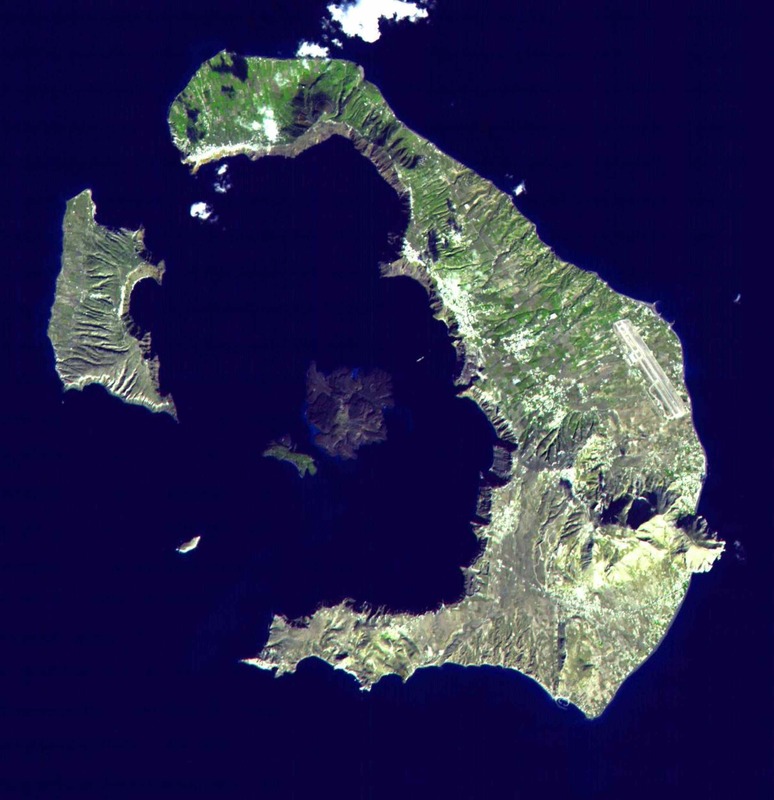 The Kameni Islands (dark in the image center) formed after the caldera., with the most recent eruptions occurring in 1950. Researchers, used photostatistics, granulometry and other techniques to estimate that the pre-Kameni had a volume of 2.2 to 2.5 cubic kilometers, compared to 3.2 cubic kilometers of today’s Old and New Kameni. According to Dr David Karaton who is an expert in Volcanology, “the topographic relief of Santorini before the Minoan eruption was characterized by a smaller port along with a central island, almost similar to today’s Kameni, according to many researchers. As the Hungarian researcher says, “we focused our attention on the most characteristic lithic andesitic specimens found in the Minoan pumice, which represent the explosive material from Pre-Kameni. “Applying a photo-statistical analysis, we calculated the volume of Pre-Kameni at 2.2 to 2.5 cubic kilometers, which is smaller than the volume of Old and New Kameni. According to the new study, after the powerful Riva explosion that preceded the Minoan era, the pre-Minoan landscape of Santorini was dominated by a shallow, flooded caldera, where slowly, as lava came out of the underwater volcano, the pre-Kameni ascended. Until now only very uncertain estimates could be made about its size and age. Assistant Professor Paraskevi Nomikou of the Department of Geology and Geo environment of the University of Athens who participated in the study told AMNA that, “the pre-Minoan caldera was smaller than today, closed in the southwest and with only one small opening in the northwest with a narrow channel. 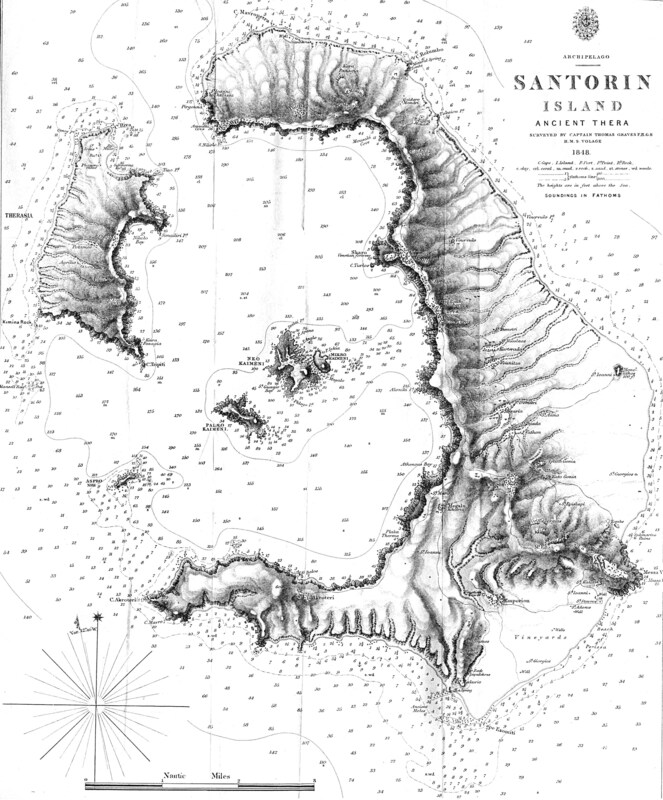 Combined bathymetric and topographic map of Santorini Caldera with 15-m grid resolution. Pre-Kameni was developed very quickly after the Riva explosion, with a minimum lava flow rate of 0.13 to 0.14 cubic kilometers per millennium. This rate is much slower – about a seventh – than the average rate of expansion of today’s Old and New Kameni after 1600 BC, estimated at about 0.9 cubic kilometers per millennium. The explosion of Thira between 1627-1600 BC during the Late Bronze Age (Minoan) was one of the largest. The products of the explosion are estimated to have a volume of 117 to 129 cubic kilometers, equivalent to 78 to 86 cubic kilometers of dense rocks. A part of these pyroclastic deposits on the seabed of Santorini comes from the pre-existing Kameni, which was completely dissolved by the eruption. Its composition of black glassy andesite, which is geochemically distinct, allowed scientists to identify which products of the explosion came from pre-Kameni and which from Thira. 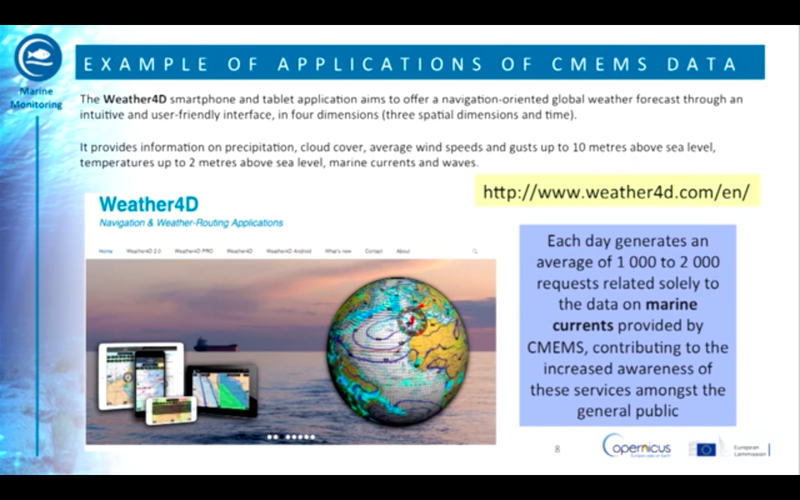 Copernicus at your fingerstips : 20 apps that you can use today ! 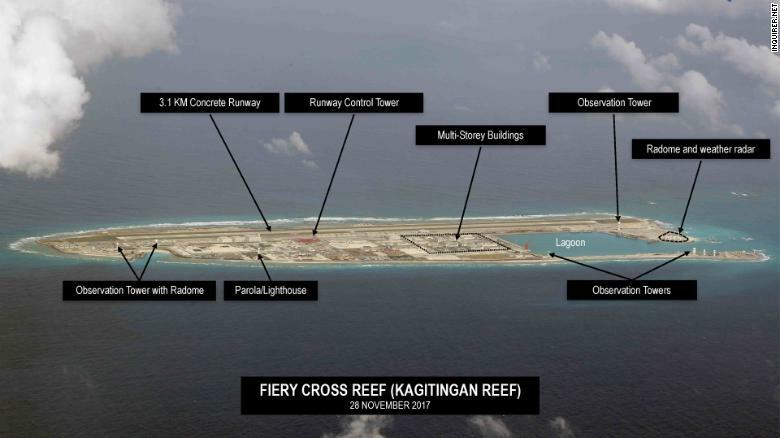 Since China began its extensive land reclamation program in the South China Sea in 2013, Beijing has focused on improving its presence and infrastructure at seven locations in the Spratly Island chain: Cuarteron Reef, Fiery Cross, Gaven, Hughes, Johnson, Mischief and Subi reefs. Of the seven locations, the Fiery Cross, Mischief and Subi reefs received particular attention in the form of large-scale airfields built there. Over time, China has also added harbors, barracks, radar and other sensors. This is in addition to communications equipment, storage bunkers and general infrastructure installed across all seven islands. 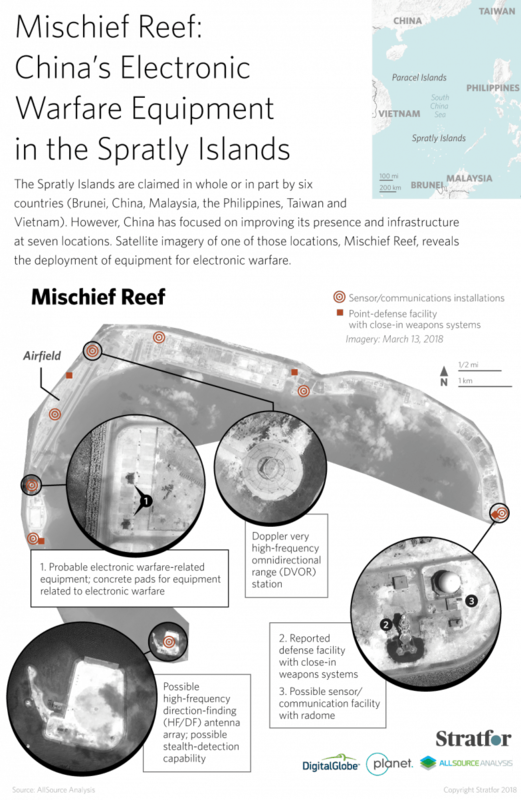 Stratfor partners at AllSource Analysis have provided imagery that confirms mobile electronic warfare (EW) equipment was recently deployed to Mischief Reef. Beijing deployed EW equipment to prepared positions in Mischief Reef, consisting of 13 concrete pads located between an airfield to the north and what is probably a motor pool area in the southeast. The imagery shows that two camouflaged vehicles, most likely mobile EW systems, were moved to the deployment site as recently as March 13. The imagery indicates that China likely engaged in periodic training at the airfield for mobile electronic warfare operations during February and March of 2018. The recent addition of mobile equipment for electronic warfare to Mischief Reef adds to the already-extensive electronic network on the reef. To the southeast, China has constructed what is probably a high-frequency, direction-finding antenna array installation which could be used to collect electronic or signals intelligence from transmissions by aircraft or ships in the region, as well as to detect stealth aircraft. North of the island, China has also built what is probably an inter-island communication tower with an associated antenna array similar to the ones found at Cuarteron, Hughes, Johnson South and Gaven reefs. On top of that, China constructed a Doppler very high-frequency omnidirectional range (DVOR) radio system adjacent to the airfield on Mischief Reef. DVOR systems provide short-range navigation information for aircraft without using satellite navigation data. The deployment of EW equipment is particularly notable because the gear could be used to harass and jam the electronic equipment of various actors in the South China Sea, including the United States. In fact, the equipment deployed to Mischief Reef could have already been used for this purpose. As Beijing continues to build up its capabilities across the South China Sea, tools like electronic warfare equipment will make the country better positioned to continue asserting its territorial claims in the region. Anglerfish, with their menacing gape and dangling lure, are among the most curious inhabitants of the deep ocean. Scientists have hardly ever seen them alive in their natural environment. That’s why a new video, captured in the waters around Portugal’s Azores islands, has stunned deep-sea biologists. It shows a fist-size female anglerfish, resplendent with bioluminescent lights and elongated whiskerlike structures projecting outward from her body. And if you look closely, she’s got a mate: A dwarf male is fused to her underside, essentially acting as a permanent sperm provider. Most of what we know about deep-sea anglerfish comes from dead animals pulled up in nets. Scientists have identified more than 160 species, but only a handful of videos exist—and this is the first to show a sexually united pair. “So you can see how rare and important this discovery is,” Pietsch says. The husband and wife team was nearing the end of a grueling 5-hour dive along a steep deep-sea wall on the south side of São Jorge Island, when “something with a funny form” caught their eye, Kirsten Jakobsen says. Aborting their plan to surface, the filmmakers followed the strange creature around for 25 minutes, capturing its movements through the submersible’s 1.4-meter-wide window. It was exciting, but also challenging to maneuver the craft to get the best images because the female was only about 16 centimeters long, she says. After surfacing, the duo sent the video to Pietsch, who identified the species as Caulophryne jordani, known as the fanfin angler. He was entranced by the species’s “gracefulness,” especially the way those whiskerlike structures—called filaments and fin rays—enveloped the animal. “Any prey item touching one of those would cause the angler to turn and gobble up that particular animal,” he says. The video was captured in August 2016, but this is the first time it’s been released to the public. C. jordani’s light show was also a stunner. Like other deep-sea anglerfish, the female has a bioluminescent, lurelike appendage that drifts in front of her head to attract prey. But in the video, the filaments and fin rays also appear to emit light at their tips and at intervals along their length—something that’s never been seen before. Pietsch suspects that the light is bioluminescent—meaning, it’s produced within the animal itself—but he notes that it’s hard to know whether the structures are reflecting light from the submersible or are actually glowing. The tiny male is also a key part of the discovery. Scientists have known about this bizarre reproductive strategy because they’ve seen dead males latched onto dead females, but people have never seen it in the wild—until now. Bruce Robison, a deep-sea ecologist at the Monterey Bay Aquarium Research Institute in Moss Landing, California, was impressed with how flexible the male was despite its solid attachment, seemingly moving around in any direction he wished. Anglerfish are an incredibly diverse group, with “a marvelous variety of structures and species,” but they’re hard to study because they dwell hundreds to thousands of meters below the surface of the ocean, says Peter Bartsch, a fish scientist at the Natural History Museum in Berlin. With recent advances in deep-water exploration technology, he adds, videos like this are much more possible, giving us a better idea about what these mysterious creatures actually look like in their deep, dark home.